This year is celebrating the European Year of Industrial and Technical Heritage. 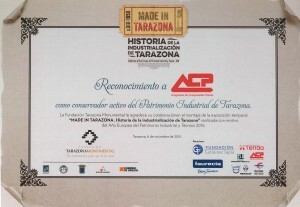 Tarazona Monumental Foundation FTM has organized a temporary exhibition on the occasion of this celebration, in which ACP has cooperated. This Foundation has awarded a Certificate of Recognition to our company as an active preserver of the Industrial Heritage of Tarazona. ACP was founded in Tarazona at the end of the 80s and although it has, therefore, a short history, our company is deeply rooted in Tarazona. CS14 – ACP’s Carbon Endless Sensor in 14mm.